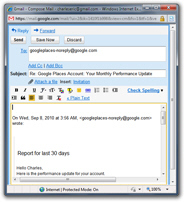 Once inside your Gmail account, perform the initial action as you usually would ("Reply", "Reply To All", "Forward", or "Compose mail", as the case may be). Note that, just like any other window, the separate Gmail editor window can be resized, minimized, maximized, etc. This is how you can send emails from a new window inside Gmail; to have more room to edit your email message, or to block any distraction and concentrate on your email, you can now view it full screen. Press the F11 key on your keyboard, which will work in Internet Explorer, Firefox, Google Chrome, and the Opera browser (check your web browser's documentation if this key doesn't show your email message in full screen mode). Now, your entire screen is devoted to the task at hand, and you can concentrate on what you want to say. When you are done, click on the "Send" button, and Gmail will email your reply to its recipients, and close this new window after a few seconds, and having shown a "Your email has been sent" confirmation message.